If everyone’s coming to yours this Christmas, it’s never too early to start planning. Thinking about it now should mean you can keep costs down as much as possible and avoid being super-stressed when December comes around. Doing your food shopping online can be an excellent way to beat the mad dash and yuletide queues: you can smugly sip a mulled wine while others are fighting over the last brussels sprouts in the supermarket. However, delivery slots around Christmas get booked up fast, so keep an eye out for when they’re released. It varies from supermarket to supermarket, but some stores will be releasing pre-Christmas slots in the next few weeks, and loyalty card holders may get priority. Butchers also tend to start accepting Christmas orders in October or November, so start thinking about your meat order asap. Some butchers and supermarkets offer festive meat hampers, so you can get a selection of different meats if you want to offer your guests more choice than turkey. If you’re going the homemade route with the Christmas cake, remember that it’s traditionally made a long time in advance (six to 12 weeks before Christmas) and then ‘fed’ with alcohol every week or two. Traditional Christmas cake recipes include mixed spice, cinnamon and dried fruits, and the cake is then drizzled with brandy and left to mature in an airtight container. There are other festive foods you can prepare in advance too. Cranberry sauce, stuffing and pigs-in-blankets can all be made in the weeks running up to Christmas and then put in the freezer. If you’re planning on buying your cake instead of making it, you may want to try the Meg Rivers cake from Ocado. It recently won first place in the Good Housekeeping Christmas cake taste test. When it comes to Christmas trees, a fake one is often the cheapest option as you can reuse it every year. Tesco Direct and Argos both sell artificial trees that come in at under £20, and you can buy online and get it delivered. If you’d prefer the smell of pine to greet your guests, there are also several online stores that sell real trees and ship them to your home, with prices starting at around £30 - £40. You can pre-order now for delivery in the run-up to Christmas. 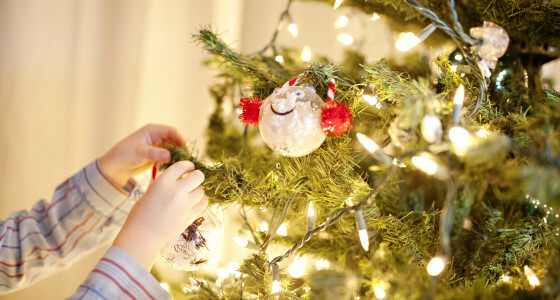 Making your own decorations saves cash, and is also a good activity for kids on rainy winter weekends. You can make loads of things from recycled household objects and odd ends. Options include painted pine cones, angels and snowflakes cut out of paper, oven-dried orange slices and paper chains. Closer to Christmas you can make gingerbread decorations too. There are thousands of DIY Christmas decoration ideas online, from button baubles to bottle top snowmen, to reindeers made of wine corks. Start by searching Pinterest for some inspiration. There’s no doubt that there’s a lot of sitting around over Christmas. It’s one of the things we love about it, but it can also be good to have some options on-hand in case guests get bored or tensions start brewing. Now’s the time to start planning: order board games at rock bottom prices online, start amassing a collection of DVDs and box sets for when Christmas TV fails to deliver (or find some Netflix movies everyone will enjoy), and put together a Christmas quiz. If there are kids coming, consider getting some bits for crafts and baking. Wintry walks are a classic Christmastime activity. If you don’t have your own four-legged friend to take on a stroll, now could be the time to sign up to a site like BorrowMyDoggy. Start getting to know a dog now, and you could have a new member of the pack to join you on your Boxing Day walk. Cooking a successful Christmas dinner is all about timing, so be sure to plan your day carefully, listing what you need to do and when you need to do it. There are other Christmas lists that can make your life easier too. For starters, figure out how long your guests will be staying and list all the meals that will be eaten during that time so that you can make a meal plan and a shopping list. To save money, try to think of recipes with overlapping ingredients or ways of using up leftovers. Next, make a list of the things you and everyone else in your house will need to do in the days leading up to Christmas. Before people arrive you will probably want to have bought and wrapped the gifts, cleaned the house, put up the decorations and made all the beds, for example. If you want to do little extra things - like stockings or table gifts - remember to plan those in too. Also make a list of the things you want your guests to bring - whether that’s extra bedding or a booze contribution - and tell them as soon as possible. There are Christmas dinner time plans online to use as a template for your own Christmas cooking timetable. Check out plans by the BBC, Delia Smith and Netmums. Will you be hosting Christmas this year? What steps will you be taking in preparation? Tell us in the comments section at the bottom of the page! Since you’re getting organised, sort your pension now by signing up to PensionBee.